DHC's Alpha-Arbutin White Face Mask effortlessly restores a radiant, healthy-looking complexion. Featuring a unique design with fold-over flaps that allow you to target the entire face and eye area, the mask synergises advanced Alpha-Arbutin, Mulberry, Serine and Peony to brighten and revitalise dull complexions. 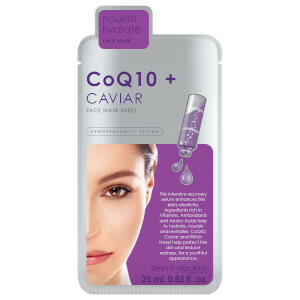 Infused with a dose of Sodium Hyaluronate that penetrates into the deeper layers of skin to attract water, the mask replenishes moisture and delivers long-lasting hydration, whilst combating discolouration caused by ageing and sun exposure. Skin is left soft, smooth and supple with a youthful glow. Limpe bem a pele antes de aplicar. Segure a tira recortada na mão esquerda e a outra tira na mão direita. Puxe a tira para abrir a película e coloque no rosto. Deixe atuar durante 20 minutos e depois remova, massajando o fluido remanescente na pele. Em seguida, faça a sua rotina habitual de cuidados da DHC.